Having completed the level 1 missions for Kraimir Mork, I then moved on to the level 2 missions. The first agent I worked for was Them Burkur of the Republic Security Services. Once again looking at the background of the agent's corporation gives some nice information. "The Minmatars learnt early on in their freedom that it can only be kept by wrapping it in secrets and deceit. The vigilance of the RSS has helped the Republic weather many storms that threatened to engulf the fledgling state. The RSS has strong links with the underworld elements in the world of EVE, the information exchange and black marketing strengthens both sides." Them Burkur offers a 3-mission storyline called "Bottleneck." The first mission, "Bottleneck - Dark Tidings", is an introduction and courier mission. "As you may be aware, the Ani constellation is beset by smugglers as well as dealers in all sorts of illicit goods. Most of the merchandise that comes through here goes to the criminal organizations, who've had this place in their clutches for far too long. "Our plan is to change that, but it's going to take a while. Every day, literally tons of arms, drugs, and even slaves are smuggled through the Nakugard ingress, whence they are taken to various parts of the constellation to be sold. Space is a big place, and hard to police, but we do what we can as we always have ― and any help from capsuleers such as yourself is much appreciated. "Yesterday, I received an encrypted message from one of my deep cover agents. It appears that one Atek Vandano, a notorious fixer loosely affiliated with the Angel Cartel's Gist division, has been establishing contacts in Ani. We're not sure what he's up to, but Command believes this is something that needs to be nipped in the bud if we're to be able to maintain any semblance of control over this place down the line. "But first thing's first. I need you to take a copy of the brief down to some associates of mine at the Sisters of EVE Bureau in Inder. We need to make sure all our operatives in the region are informed of what's going on so we can begin formulating a counter-plan if necessary. Report back to me when you're done and we'll take it from there." He offered 14,000 isk for making the one system trip, with a 16,000 isk bonus for accomplishing the task within 12 minutes. I'm not sure the significance of the fact that the RSS has agents in a Sisters of EVE station. Has the RSS and Sisters joined forces in the Ani constellation? Finishing the mission, I returned to The Glass Edge and received the second mission, "Bottleneck - Human Traffic." "Well, we've found out what Atek Vandano's up to, and it's not pretty. Hold on to your seat ― if you're anything like me, this is gonna piss you off something awful. "The good Mr. Vandano, it seems, is not working for the Gist on this particular occasion. Our agents have uncovered data that indicates he's helping to bring in slave labor from Amarrian colonies to the Joint Harvesting stations in this system. We think they might be here as part of the Insorum scare; our information shows that the influx of slaves to Amarrian facilities within Republic space has increased manifold in the past weeks. The holders are protecting their "investments" by bringing them to our turf under the guise of contract laborers. Vandano thinks he can do this right under our noses. We're not going to let him. "Obviously, to avoid an incident with the Amarrian Ministry of Foreign Affairs, we'll have to go about this in some fairly unconventional ways, and we'll have to use operatives not officially affiliated with us. You know where I'm going with this, right? "Vandano has an associate, a lady by the name of Nanom Basskel. We have reason to believe she's one of the major architects behind this plan, and according to our intelligence she's in possession of documents detailing where they're keeping the slaves before final transport to the Joint Harvesting plants in system. She can usually be found at the contested military depot in Inder. Go out there, 'remove' Miss Basskel, and bring me these documents." I already had experienced the pleasure of meeting Miss Basskel in the first room in the contested Minmatar military depot and looking through the wreckage of her ship. I still had the documents in the cargo hold and was able to present the evidence to the RSS agent then and there, collecting not only the 297,000 isk reward, but a bonus of 354,000 isk for finishing the mission within 6 hours. The final mission from Mr. Burkur was "Bottleneck - Liberation", in which I needed to destroy the slave containment facility. "Thanks in no small part to the documents you brought, we now have the location of the temporary facilities in this system where Vandano and his cohorts intend to keep the slaves while their forged documents are being submitted to the Republic. According to our reports, they will then be brought to the Joint Harvesting Plantation in Barkrik. If you head out there now and destroy this outpost, our other team should be in a prime position to intercept the slave convoy when it comes in." Running the mission in a Rupture was easy. I received a 38,000 isk reward as well as a 32,000 isk bonus for completing the mission within 32 minutes. In addition to the bounties from 5 frigates I also picked up 100 Sabretooth Light Missiles, 10 Cap Booster 25s and 10 janitors. I'm not sure exactly what I am going to do with 10 janitors, but I couldn't just leave them out in space. Running the Bottleneck series of missions was very profitable for the very short amount of time it took to complete. Here is the haul. Republic Security Services Gain (unmodified) : increased from .38 to .81. I saw a tidbit while surfing the net yesterday and couldn't resist posting about it. Orbital Technologies Corporation, based in Madison, Wisconsin, has plans for a space hotel in Earth orbit. Yes, we are getting closer to a corporation in space. And a corporation moving to get its own Captain's Quarters into space. 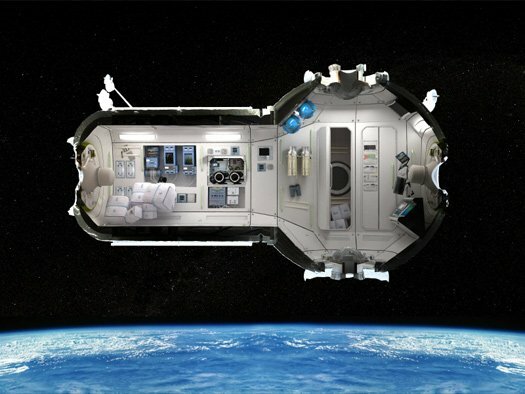 The real life version might be a lot cheaper than the Eve Online variety, only costing $165,000 for a 5 night stay. And doesn't this look cosy? Of course, it doesn't have a cool door like the Captain's Quarters does in Eve Online, but you can't have everything. With an estimated launch date of 2016, CCP will need to move a bit quicker with Incarna and Walking in Stations if they want to keep ahead of real life. Of course, the price of a ticket on Icelandair to get to Fanfest is a lot cheaper than the $800,000 ticket to get to one of these luxury suites. Luxury suite? This isn't even as good as our Minmatar Captain's Quarters. I wonder if anyone flying up there would be interested in a monocle? "Nakugard is the entry system into the Ani constellation, ancestral home of the Nefantar tribe. The constellation enjoyed great prominence while the Minmatars suffered under the Amarrian yoke. The Glass Edge served once as a surveillance outpost for the Nefantars, but today it serves as a reminder of what the Nefantars stood for. The tribe used its privileged position to gather great wealth here, sometimes by force, but more often through guile and veiled threats. That is the glass edge, it may not be hard or obvious, but it will make you bleed all the same." Having decided that dealing with Caldari isn't what I wanted to do, I decided to move to the next site in Nakugard, The Glass Edge. The Glass Edge is home to four COSMOS agents: Dalkar Kersos, Kraimir Mork, Penda Rakken and Them Burkur. The highest level agent is Dalkar Kersos at level 3. I am fortunate in that both Wandering Rose and Rosewalker have the standings to do all level 3 missions with any Minmatar corporation, with Roswalker having the standings to do level 4 missions. I've discovered that doing a little research on the agents gives me some background that makes doing the missions a little more enjoyable. But in true Eve Online fashion, a player really needs to dig into the background material to get the full enjoyment. I guess the devs figure that most players don't read the quest text. Well, I guess that's why they invented the Evelopedia. For those who are interested in the lore, I'll run down the agents as I do them, especially since I am finding the Evelopedia entries to be either incomplete or a bit inaccurate. First, I approached the level 1 agent, Kraimir Mork with The Leisure Group. Not only does it make sense to do the only level 1 agent first, but The Leisure Group is a partner of the corporation Wandering Rose is closest to, Eifyr & Co. The description of The Leisure Group might also give some insight into Wandering Rose's background. 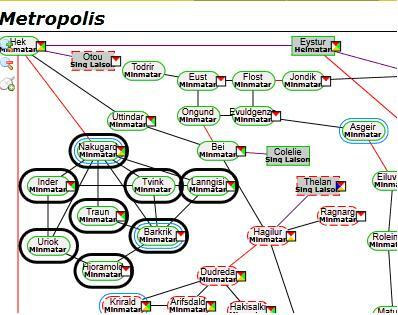 "The enigmatic Kolvil Eifyr is a large shareholder in the Leisure Group and this ties the company in with the criminal elements so strong in the shady world of Minmatar power politics. The Leisure Group is an entertainment company that is known for its barbaric, yet stirring, pleasure nodes." Ms. Mork gives the storyline mission Gladiators - Breathing Space. The first part is a mission to deliver 150 units (not m3) of oxygen for a very basic business reason. "I own and operate a portable arena of cyboerians, cybernetically augmented gladiators who fight each other for show, demonstrating a wide range of Matari martial arts. I was having problems generating revenue in my old home, so I relocated to Nakugard. "Shortly after I got here, though, a problem reared its head. Obviously I'd underestimated the extent of influence wielded by the criminal element in this area. Within weeks, most of my fighters were strung out on various illicit drugs, and I've since had to close up shop. Can't have a show if you don't have performers. And to make matters worse, my contract with the Leisure Group is still in full effect; if I'm not generating my revenue they're not going to be happy, and we most definitely do not want the Leisure Group unhappy. "There are a few things I need to be able to get my arena up and running again. Among these is oxygen; I can't very well run the place if no one can breathe, you understand. If you can go out and find me 150 units of oxygen, I'd be much obliged. " She offered me 32,000 isk to pick up the oxygen and another 35,000 isk if I did it inside of 58 minutes. Hmm ... with Hek only one jump away and Wandering Rose in a Prowler, what could go wrong? This is Eve, but counting the ways would take too much time. But in this case, nothing went wrong. I picked up 150 units from a buy order for 100 isk/unit and went back to the agent. Spending 15,000 isk to make 67,000 isk? That was nice. Even nicer was a second mission offer. "I have three fighters on hand right now, but I need more to be able to run my show. I just received word that one of my best, Grace Tarsis, is being held by a group of Cartel thugs in a deadspace location here in Nakugard, on account of some unsettled debts. If you can find her and bring her back to me in one piece, I'll be a step closer to re-opening my arena and evading the Leisure Group's wrath. They're keeping her in a brothel in their lair, one that's not really that heavily guarded. If you kill the guards and blow up the brothel, you should be able to get her out and bring her back. If you can do that, you will have my most heartfelt thanks." The offer for this mission was 23,000 isk, with a bonus of 21,000 isk if completed within 30 minutes. With news of the Cartel in the area, I called Rosewalker into the fleet, loaded up the Ruptures and made quick work of the 3 frigates guarding Grace. I didn't bother to salvage, but did pick up 100 Seeker F.O.F Light Missiles and 1 Punk ID Slice, which might come in handy. And the bounties for the three guards came out to another 22,000 isk. ISK (mission awards + bounties - purchase of oxygen): 123,000. Loot: 100 FOF missiles, 1 Punk ID Slice. "Okay little sister, what's Plan B?" Rosewalker said looking at the holographic model of the old Nefantar stronghold. "There are a lot of those Gist Angels hanging around there." "Ruptures," Wandering Rose replied. "We set up a couple of Ruptures with analyzers, park at the containers, deploy the drones, and kill all the scavengers and treasurer hunters until the interference ends and we get the blocks. Easy." "Easy, she says," Rosewalker said while rolling his eyes toward the ceiling. "Did you forget we only brought one Rupture with us? The other is sitting in the corporate hangar to be used to make a Muninn." "Okay, so I go back to HQ, pick up the ship, go to Rens and do some shopping and come back," she said. "No problem." "Why go through so much bother to complete a 15,000 isk mission for a Caldari corporation?" Rosewalker inquired. "I am not going to fail on the first mission I do in Ani," she replied, getting off the couch and walking over to her brother. "More importantly, I gave my word that I'd do this," she continued, poking him in the chest. "I keep my word, even if some know-it-all mystic thinks its foolish." "Okay, okay. Well, at least I get to shoot up more Angels," he sighed. And shoot up more Angels they did. They re-entered the debris field as a Thrasher departed and put the plan into action. Each Rupture parked next to a container and once the opposition forces either scattered or died (mostly died) the pair gathered up the blocks plus some additional artifacts. At this point Wandering Rose grew a little too confident and led her two-ship gang to do battle with the Angels at the other side of the field. While battling that force, a new Angel force hit Wandering Rose and Rosewalker from behind. While the pair worked at reducing the ships facing them, the Angels worked on destroying the siblings drones. The Angels managed to destroy 7 of the 10 deployed drones before the remaining 3 made it back to the drone bay. At that point, Wandering Rose called for a withdrawal from the field. "Well, that didn't go too bad," Wandering Rose said as they landed at the Nakugard gate. "It didn't go too well, either," Rosewalker replied. "You had a good plan, but you didn't stick to it. The plan was to do a smash and grab. You should have pulled us out once we achieved the objective. The amount of isk you're going to get for those blocks from that Caldari slimeball won't pay for the drones we lost." "I know. But at least I can say I completed the mission and my reputation won't be shot my first day in system," Wandering Rose said. "I'll fly out to the site and drop off the merchandise. See you back at the station." A while later, Wandering Rose returned to the Republic University station. She was not happy. "Didn't go well, did it sis?" Rosewalker asked. "No. After turning in the blocks, he doesn't want to do business with me anymore," she replied. "I believe it. I don't know if you checked what those things are going for," Rosewalker said. "No. I was concentrating on fulfilling my end of the deal," she said. "How much?" "Well," Rosewalker began, "the buy orders are starting at 2.4 million isk each." "Um," she stammered, "2.4 million?" "Yep. And you got 15,000 isk for them," Rosewalker pointed out. "But I did fulfill the deal," Wandering Rose pointed out. "Honor is fine, but most people would call you something," the mystic said. "And what's that?" the CEO asked. Not the most auspicious beginning to the Ani Campaign. But things can only go up from here. "The Nefantar, also known as the Amatar, channeled a great amount of ill-gotten Amarr wealth into the Ani constellation. Though much of the money was wasted on the extravagance of the Amatar elite, some of it was actually put to good use. One such use was the construction of this reactor factory, which was the first space-based industrial complex to be operated by the Amatar." If finding something useful built by the Amatar was unusual, so was what Rosewalker found once he adjusted his overview settings. He opened up a comm link to Wandering Rose and calmly said, "Little sister, you're not going to believe this..."
With Rosewalker not having the, to put it kindly, best of relations with the Caldari, Wandering Rose soon found herself flying to the factory site to meet with the Poksu Mineral Group's Tzumi Pokkolen. "Hello there," the Caldari mining agent began, "you're interested in a little bit of work, yes? For many years I've been making a brisk business selling Nefantar artifacts on the black market. The buyers are all kind of people, mostly Ammatars looking for lost heirlooms or idle-rich Gallenteans looking for something unique to flaunt at the next gala showing. I long since decided to outsource the gathering of artifacts to other, more capable pilots." "Ah, yes I am," Wandering Rose replied. She was looking for shady characters and this one was perfect. Shady, lazy and/or incompetent and the way he was running his mouth, innocent. That's a pretty bad combination in the business world of New Eden. "But there can't be that many people out there willing to buy a load of old Nefantar junk." "It's not just Nefantar artifacts. Lately the pilots working for me have been returning with more and more of some strange artifacts that I'm beginning to suspect are not of Nefantar origin. I've seen these items on occasions in the past, but now a lot more are coming in," Tzumi said. "Not that I'm complaining, mind you, for I've always had an easy time shifting them. It's getting so easy, in fact, that I'm on a constant lookout for more pilots to collect for me. It is my understanding after having talked to my other pilots that a contested complex over in Inder is the best place to find the times I want. If you do well you can always get more work from me. Might even provide a steady income for you. To locate the right items you need the right knowledge and equipment, naturally, "
Knowledge and equipment, she thought. That meant archeology and analyzers. Both she and her brother could handle that. So she made the deal, two sleeper foundation blocks for 15,000 isk, with a 10,000 isk bonus if she returned within an hour. "Here's the plan," Wandering Rose told Rosewalker when she got back to the station. "You take the Jaguar, take out anyone who tries to get in the way, and I follow along in the Rusty Broom. Once we get to the wreckage or whatever is in the area, I use the analyzer and we get out of the area as soon as I have the blocks. Any questions?" "Are you sure one assault frigate has enough firepower to handle anything?" Rosewalker asked. "Not really, but with the pay Tzumi is offering, getting the blocks can't be that hard, right?" she reasoned. In the beginning, Wandering Rose's logic looked correct. After jumping through the first acceleration gate into the contested Minmatar military depot, Rosewalker made quick work of a gang that looked like it was led by a Amarrian national, Nonom Basskel. Although her ship was destroyed, Basskel got away. Wandering Rose found some interesting things as she salvaged the wrecks. "Well, well, " she murmured as she went through the ship's logs. "Our Miss Basskel is a slaver. Figures. This might come in handy someday," she said as she tucked the logs into a safe place. "Bad news bro. Looks like these guys are smarter than they look. You'll have to clear the area for the analyzer to finish the job," Wandering Rose concluded. And with that transmission, she came under file and had to beat a hasty retreat. Some time later, Rosewalker had to tell Wandering Rose the bad news. "This isn't going to work, sis. The rocket launcher is dry and I don't have much ammo left for the autocannons. There are just too many ships out there." "Okay, let's get out of here. Time for plan B." "You have a plan B?" Rosewalker asked. "Not yet," she replied. "But I will by the time we get back to Nakugard." Having decided what I wanted to do the COSMOS missions in the Ani constellation and done some preliminary intelligence gathering using the Evelopedia and Dotlan, the next step was to actually deploy my ships to the Republic University School station located at Nakugard V. Why there? Four reasons. The first is that Nakugard is centrally located, not only just one jump to 6 of the 7 other systems in the constellation but also one jump from the trade hub system of Hek. Next, the Republic University station is the only one in the constellation with manufacturing facilities. Third, out of all the corporations in Ani that own stations, I have the highest standing with Republic University. Finally, while the Krusual are Matari, they also have a reputation for being sneaky and I just don't trust them. The next step was determining what to bring. I'm planning an extended stay lasting at least until I go to Bulgaria at the end of September, so I needed to bring a lot. I brought everything from assault frigates to battlecruisers to do the COSMOS combat missions and a Prowler to quickly do courier missions. I didn't spot any mining missions, but with the abundance of asteroids in Ani, I figured I'd bring my Covetor, if for no other reason than to replace my mineral stocks with all the ammo I plan to use. And because I saw one COSMOS mission that requires scanning down a site, I brought my Cheetah. In total, I brought 12 ships in addition to large amounts of projectile ammo and missiles to Nakugard. Twelve ships? That took a lot of time, right? Wrong. The 12th ship is my Orca. Between loading up the industrial command ship to the gills and Wandering Rose scouting ahead ferrying a couple of additional ships, I managed to bring everything in three trips. I should have only needed two, but I forgot to bring the Covetor on the second trip. I think my sub-conscience was trying to tell me something. And moving the Orca in a fleet getting the fleet agility bonus makes the trip go much faster than the Orca moving solo. So now I'm in Nakugard and doing the COSMOS missions. I finished the first one on Sunday. I'll get to that story tomorrow. The Minmatar high-sec COSMOS missions are found in the Ani Constellation. But the Ani Constellation offers more to players than just a chance at rapid faction gains and a chance to get some meta-level 3 blueprint copies. Here are some additional reasons why I looked at the Ani Constellation as a fun place to spend the next few weeks playing Eve. Security: The Ani Constellation is a bit unusual in that all 8 systems have a security level of .5. This is a plus in that the systems are high-sec, although the response from CONCORD will be slow, so tanking against suicide gankers is warranted. Some distribution missions from local agents can easily send unsuspecting pilots into low-sec, so pay attention to your low-sec warnings. "Joint Harvesting was formed a decade ago when several agricultural and mining companies joined together to form one giant company. One of the largest raw material companies in the world of EVE, Joint Harvesting conducts a wide variety of resource gathering and operates both inside and outside the Amarr Empire." 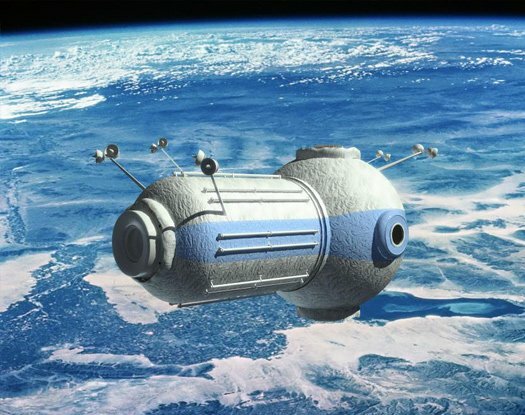 The one interesting fact about Joint Harvesting is that of the four station-holding corporations in Ani, it is the only one without medical facilities located in the constellation. Krusual Tribe - The second biggest presence in Ani is the Krusual Tribe. The Krusual hold 3 stations with 7 agents, including 1 level 4 agent, in the key system of Nakugard. The Krusual have a reputation as sly and cunning, shrouding its ways in lies and secrecy. It is isolationist by nature, but lately it's been becoming more and more involved with the power politics of the Republic, staking a claim for its mastery. "The Krusual tribe initially inhabited the mountainous region of the upper Tronhadar-valley on Matar. The other tribes regarded the Krusuals as the most barbaric of them all, but that stemmed more from a lack of knowledge about the intricate culture of the secluded Krusuals rather than being an actual fact. The Amarrians had real difficulties subduing the Krusuals during their conquest of the Minmatars and the unruly Krusuals in their mountain bases were always a thorn in the Amarr side." Sisters of EVE - Given its history of providing humanitarian aid during the Minmatar Rebellion and the possibility of conflict between the Krusual and the Amarr industrialists, few should find it surprising that the Sisters of EVE have a presence in Ani. The Sisters maintain 4 agents as well as medical facilities in 3 stations in the constellation. "But the Sisters do more than just come to the aid of those in need. They are also devoted practitioners of their religious beliefs, which center around the EVE gate. The Sisters belief that this ‘relic from god’, as they call it, holds the key to the universe and are determined to unlock it, in order to bring ‘everlasting peace under god’s guidance and guardianship’ to the world of EVE. The Sisters maintain that god resides at the other side of the gate and from his domain he guides the lives of those that belief in him and keeps them out of harms way. The Sisters have large followings in all the empires (even some Jovians) and the organization is mostly run on donations from those followers, as well as from some limited commercial enterprises and tariffs levied on those visiting their stations." "The Republic University (from where future Minmatar industrialists graduate) was founded by Minmatar emigrates as a show of support for the fledgling republic shortly after its inception. The school is modeled after the University of Caille and based on the Gallentean education system." In addition to the four corporations listed above, the Ani constellation is also home to a large contingent of the Angel Cartel as well as COSMOS agents plying their trade at locations in space. Moons and mining - The low security levels of all the systems in the Ani constellation are conductive to economic activity even with the presence of only one station with manufacturing facilities. The constellation boasts 283 total moons with 60 alone located in Nakugard, one jump away from the Hek trade hub. But that is not such an advantage as 180 of the moons are withing 2 jumps of Hek. And the .5 security level is the lowest bar to anchoring a POS in high-sec, meaning the bulk of industrial activity like manufacturing, research and blueprint copying takes place in POS, making the numerous capsuleers who call the area home a potential big power bloc. The mining opportunities are as good as it gets in high-sec. The constellation boasts 80 asteroid belts containing Plagioclase, Scordite, Veldspar and Omber. In addition, Ani contains not one but two systems with ice belts. Those with loyalties with the Minmatar will enjoy Nakugard's refining facilities along with its 23 asteroid and 1 ice belts. The Amarr are not far behind with Joint Harvesting possessing good refining facilities in Barkrik with its ice belt and Hjoramold with its 12 asteroid belts. The Caldari and Gallente, if not wishing to gain faction with either of the other two rivals, can always use the Sisters of EVE facilities in Inder with its 16 asteroid belts, although the Caldari don't really do more than tolerate the Sisters. Exploration - I'm not sure exactly the exploration possibilities in Ani, but with every system having a .5 security level, bringing along a ship capable of doing some serious scanning is probably warranted. This concludes my initial look at the Ani Constellation. I'm sure I will find more as I explore all the mysteries that this interesting area of New Eden holds. Mini-Profession missions require you to obtain items which can be obtained through the use of one of two special skills, Archeology and Hacking. In each case, the skill needed will be mentioned in the mission briefing. Mini-Profession missions will always appear as single missions, never as part of a storyline. If you decline a Mini-Profession mission, you will not lose standing with the agent, and you may continue to talk to the agent. If a mission requires Hacking, you will need to fit a codebreaker module to your ship. If a mission requires Archeology, you will need to fit an analyzer module to your ship. In each case, the general flow of a Mini-Profession mission is that your agent will tell you to go to a specific historic site. Once there, you will encounter a number of NPCs, which guard special loot-containers, which may only be opened through the use of the appropriate module. After dispatching as many NPCs as is necessary to reach the loot cans, lock the can, activate the module, and scan for the components inside. Alternatively, it is possible to obtain the components through other means. Often, they may be found on the market, or on Escrow. 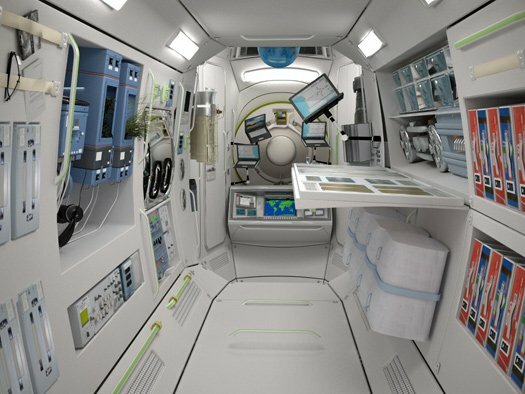 It is also possible to contact other pilots in space and arrange to trade or buy these special components. So if you do not have the Archeology or Hacking skills, it is possible to complete these missions, though it may cost you additional money to obtain the necessary components. Storyline cosmos missions, like traditional storyline missions, will always come in a sequence, which will be shown as part of the title, for example: "(1 of 4)". Storyline missions will always end in a mission which will affect your faction standings, based on your success or failure. Storyline Cosmos missions are also unique in that you always get only one shot at them. If you fail or decline any mission in the sequence, the storyline will terminate and the agent will no longer talk to you. Once you have completed the storyline, you are done with the agent, and they will no longer talk to you. Storyline missions come in three basic types. Courier missions, which require you to transport items from one place to another. Acquire missions, which require you to find items and bring them to the agent. Kill missions, which require you to destroy a group of NPCs as specified by the agent. Basically I can only run through the COSMOS missions once on each character, so I really needed to put some thought on how to approach doing the missions. Speaking of putting thought into running the missions, I decided to spice up the experience a bit by making up my own story. Why not? Eve is a sandbox game in which players create their own content. Why couldn't I come up with my own storyline? I've done some light roleplay with the way I play Rosewalker and Wandering Rose so I just needed to expand on the concept. So I came up with the concept of "The Ani Campaign." The story is simple. Wandering Rose, the CEO of a small corporation operating in the Minmatar Republic, is looking to expand her business. Her research has indicated that the Ani constellation in Metropolis is a promising place to do business. Not too far from her planetary interests and adjacent to the Hek trade hub, rumor has it that business is not just conducted in stations but out in space as well. In addition, this effort marks Wandering Rose's first major effort to lead both the business and military activities of her corporation, the Khumaak Flying Circus. Throughout the first year of the corporation's history, Wandering Rose has handled the business aspects while Rosewalker led military operations. Now Wandering Rose is feeling confident enough in her abilities to lead in all aspects of the corporation. But is that confidence justified? Out of character, I have 3 main goals in The Ani Campaign. The first is a bit of character development. I think the whole campaign will provide interesting events to spice up the character histories of both Rosewalker and Wandering Rose. In addition, the faction and corporation gains should be very nice. Currently Wandering Rose's standing with the Minmatar Republic is 3.36 modified and I would really like to get that up to 5 by the time that all ends. If at the same time I can raise faction with The Servant Sisters of EVE up to 5 (currently 3.19), that would be a bonus. Raising Rosewalker's standings is also important, as he has an unmodified standing with the Minmatar Republic of 4.28. If I can get that over 5, I can start anchoring structures in high-sec. The second goal is economic. The COSMOS storyline missions give out blueprint copies and faction ammunition. Sure, the blueprint copies are for meta-level 3 items, but until CCP gets around to their revamp of high/low/null sec, this is the only way I know of to make named items. And I do want to make them. In addition, getting my faction up will allow access to better R&D agents. I'm really looking to find agents a bit closer to home, although there really aren't many. And if I run into any business opportunities (like courier contracts) I'll snap them up too. And the third goal? To have fun. I know that internet spaceships is serious business, but I guess I never did play this game right. Then again, Eve is a sandbox, so I'll play the way I want. And if that causes anyone to QQ, well, that means I'm actually playing the game right. Sometimes blogging is very good aid in playing Eve. I just came across an example. I was researching an article on uses for dog tags and I stumbled across the Minmatar COSMOS Guide. Although I'd heard of them vaguely when I read about how to get faction battleships using pirate tags in ISK 3.0, I never really looked into them before now. I think I've been missing out on an interesting piece of the game. Here is a description from the Minmatar Guide. "The Minmatar COSMOS constellation can raise faction standings from 0.0 to over 5.0 unmodified with no additional storyline missions run. It is recommended you have Republic Fleet standings above 6.0 beforehand, though these missions can assist you in achieving those standings. COSMOS complexes generally have widely varying ship class restrictions from frig to battlecruisers. Battlecruisers are generally the preferred ship to generate isk, though an assault frig will not have to worry about gate restrictions. Most courier missions can be done in an assault frig, though may require cargo expanders. "Unless you buy the items needed off the market, you will need an Analyzer and a Codebreaker for some of the missions/plexes. Nakugard makes a good base of operations, as many of the mission and agent locations are in or next door to Nakugard." Analyzers? Codebreakers? Assault ships as a recommended ship type? And battlecruisers instead of battleships? Forget making isk grinding level 4 missions, I want to try this! Looks like I know what I'll be doing this weekend. Well, trying to do, I should say. Industrial Revolution or Bad Luck? "Throughout history, poverty is the normal condition of man. Advances which permit this norm to be exceeded — here and there, now and then — are the work of an extremely small minority, frequently despised, often condemned, and almost always opposed by all right-thinking people. Whenever this tiny minority is kept from creating, or (as sometimes happens) is driven out of a society, the people then slip back into abject poverty. "This is known as 'bad luck.'" While Glenn Reynolds at Instapundit has used Robert Heinlein's quote to make political points for years, I'd like to drag it back into the realm of science fiction, or at least the sci-fi MMORPG Eve Online. Recently CCP came out with two dev blogs detailing a future vision for null security space. For those unfamiliar with Eve, null security space is the "anything goes" area of the Eve universe that players have made their own, building and destroying empires there on a regular basis. The ideas presented in the blog posts, if implemented, would change the economy of Eve. While the game's developers wish to have large numbers of players roaming null security space participating in the great wars, as of the end of 2010 only 11.3% of characters in Eve resided in null sec regions. 79.6% of characters resided in the high security space of the game's four non-player controlled empires under the umbrella of CONCORD, the game's police force. Many of those living in Empire space are engaged in economic activity and just want to go out and make money. So the challenge for the game developers is to entice these industrialists to enter space in which they are considered prey and must rely on other players for protection. The solution the developers came up with is an industrial revolution that will take 5 or more years to phase in. I call it a revolution for good reason. Currently null security space is not exactly a friendly environment for industrialists. After the proposed changes, null sec would become the only source of high end materials required for the lucrative production of tech 2 items and ships. In fact, null sec would become almost self-sufficient in items, only needing a few low bulk items from Empire space. Industrialists will flock to null sec to reap the profits, right? Well, CCP can change the game mechanics, but can they change players attitudes? The industrialists CCP wants to entice to null sec are called something else by the players who currently make up the corporations and alliances that control the null sec empires. Carebears. Yes, these industrialists are frequently despised, often condemned and almost always opposed by right-thinking pilots who cannot understand the ways and thoughts of those who do not wish to engage in player vs. player combat. Organized events such as Jihadswarm and Hulkageddon have targeted miners and others who engage in economic activity. For many alliance leaders, industrialists might be tolerated as members of renter alliances, meaning they are second-class citizens. If those industrialists are not willing to fight, out they go. One of the features that sets Eve Online apart from other MMORPGs is the advanced economic system in which a huge number of industrialists manage to support the epic wars in null sec. Throughout the history of MMORPGs good economic systems are the exception, not the rule. While CCP can create systems that make economic activity attractive in null security space, players still have to use the systems as intended. And in the sandbox known as New Eden, players frequently surprise the developers. The fact that CCP is working on a long timeline gives them a greater chance of success than if they sprung all the changes upon the player base at once. But if they cannot change the attitudes of players, large numbers of industrialists may leave the game. If enough leave, the economy will suffer. In technical terms, that is known as bad luck. War Against Automated Gaming Agents? CCP Sreegs came out with a dev blog yesterday about the use of the new "Report A Bot" feature. More than 500 reports of suspected bots have come in, and apparently in many cases the person submitting the report is so bad at telling a bot from a real player that CCP Sreegs actually suspects some players are actually using the feature to try to grief other players. Hard to believe, right? Being the kind, understanding type, CCP Sreegs' dev blog also gives tips on how to detect botters. Therefore, before submitting a report, we encourage players to perform a brief but structured investigation. What is each individual phase of the activity a subject carries on ? Consider each phase a "State"
Example of states : "Idle, Docked, Warping, Mining, Hunting, etc"
When does the activity of a subject change ? Consider each change one or several "Conditions" that has been met and a transition to another "State"
Example of conditions : "if state is mining and cargo is not empty then; if state is mining and ship is targeted and enemy is not NPC then; etc"
How does the subject carry on his activity ? Example of an action in a certain state when a certain condition has been met : "if state is mining and ship is targeted and enemy is not NPC then warp (to safe spot); etc"
Finally, use your human intelligence to determine whether it is a soulless automaton or simply a fellow, single-minded player. There are different types of bots, each type having other rules according to which they carry on their activity. Try to adapt your investigation to the type of bot you are observing. Having covered the War On Bots™ now for a few months, I think a smart miner would align when seeing a spike in local, even in high-sec. Suicide ganking is an accepted tactic nowadays as long as you can say the target is a bot. It is part of the reason I don't have a Hulk yet. A Covetor is just easier to replace, especially since I don't like mining that much. "It describes Automated Game Agents such as Bots and Macros in much greater detail, including the principles, concepts and techniques used to bring them into existence, how they work and what their limitations are. It is meant to give everyone hints on how to differentiate Automated Game Agents from human players right from within the game." Automated Gaming Agents? War on Bots™ just sounds cooler. The skill queue. For some, the fact that learning skills are time-based is an absolute turn-off to playing Eve Online. For me, creating and maintaining my skill queues is an interesting mini-game that I spent most of my dedicated Eve time on this weekend. Grasping and accepting the skill queue in Eve takes a different mindset than when playing a fantasy MMORPG like World of Warcraft. In a fantasy setting, a character learns skills through actually performing actions. In the world of New Eden some 210 centuries in the future, learning for capsuleers is performed by implanting the skills into pilots' heads. So for pilots, the skill queue is an important part of life. If this sounds like I'm a role player, well, the "RP" in MMORPG does stand for "role playing". From a design standpoint, I think the current skill system makes sense. One, Eve has a big enough problem with macro'ers without giving another reason for players to do so. See Darkfall for an example of a PvP game that winds up with players macro'ing to develop skills. Making the gaining of skills time-based takes away that incentive. The most important aspect I like is that the skills leads players to create their own "classes". Perhaps more importantly, the players then behave like those capsuleers actually should. Let me use mercenaries as an example. Alekseyev Karrde, the founder of the Noir. Mercenary Group, is one of the top, if not the top, mercenary commanders in Eve. He runs his corporation as a professional organization and his pilots act that way or they are out. In contrast, there is no such penalty for a paladin in a game like EverQuest 2 from acting very unpaladin-like. Perhaps my background in pen & paper D&D influences my opinion, but a player's actions should have consequences. In Eve, they do. I realize that I have slid away from the skill queue and into how players choose to play. But in Eve, player social interactions are also another way to develop characters. A pilot is not just a set of statistics. A character is also judged by their status with NPC corporations and factions, the contents of their wallet and the corporation and alliance they fly with. Moving up the ranks in a corporation is every bit as important, if not more important, than the skills a player possesses. Skills count, but so does interaction with others. A lot of players forget that and just concentrate on stats. The really successful ones don't. At the beginning of the year I wrote about how I wanted to lose another 10 pounds on top of the 45 pounds I lost last year. After a bunch of starts and stops I think I'm finally in the dieting groove and I'm only 3 pounds away from my goal. But temptation is always out there and today I faced my biggest test yet: cupcakes. I'm not sure exactly who brought them in, but there were cupcakes everywhere. And the temptation got stronger and stronger as the night wore on. But I resisted and my diet is still intact. As I was trying not to think about cupcakes, I started to think about Eve Online and Eve's version of cupcakes: PLEX. How are PLEX like cupcakes? Well, for me, buying PLEX and converting one to isk would be a bit like cheating. I came into the game wanting to get my in-game currency the old fashioned way. That's right, I wanted to earn it playing the game, not purchasing it via micro-transactions. In cupcake terms, eating PLEX would spoil the main meal of my economic play, such as it is. But if you get hungry enough, that cupcake sure looks tempting. I've never been in the position where I was flat broke in Eve. With the recent agent changes meaning I can pick up courier missions at will, I don't think I'd ever have to resort to buying isk with real-life money. But some people are addicted to purchasing isk. They see it as a necessary evil in order to afford the isk to play Eve. People like that I understand are heavily into PvP or trying to build or maintain a corporation. Personally, I pay enough for my subscription. I really can't see paying real life cash on virtual items that likely will explode in the very near future. But Eve is a sandbox, and since the rules allow it, who's to say it's wrong? Not me. While I don't understand an addiction to buying PLEX, I definitely understand one to cupcakes. Last night I managed to sneak in one mission before going to sleep. Eve Survival is nice that way. I can look up the mission and figure out how long it will take. I did part one of The Rogue Slave Trader and it only took 15 minutes. That fit right in my play schedule. While doing the mission I decided to play with the tactical display for the first time. I must not have used it right, because I didn't get anything out of it. I guess seeing how far out something is useful, but I get the same intelligence looking at my overview. My fantasy MMO background may be getting in the way. I prefer the view of my ship where it is as big as possible and I just scan the camera drones around when the overview doesn't give me the direction information I need. I have the feeling that to really use the tactical display correctly I'd need to keep my ship zoomed out so it looks like a tiny dot. That seems like such a waste of such a graphically beautiful game, at least when running missions. So I'm wondering. Is the tactical display not that useful or am I just a n00b that needs to learn how to play Eve? Today marks the two year anniversary of when I began playing Eve Online. Two years! And looking back, one year ago today a player lost 74 PLEX while flying in a Kestrel in Jita while war-dec'd. I usually take a look back every six months or so to just look back at what I've done and what I'd like to do in the future. So what have I accomplished over the past year? Not much, if anything at all, socially. I've stayed confined to my corporation, the Khumaak Flying Club. I've always had the impression that a corporation would demand a lot of time, something I don't really have in abundance. In the past twelve months, in addition to working a crazy schedule, I've taken business trips to London and Sofia. I'm now at a point that I've grown attached to my corporation and really don't want to leave it. Yes, a corporation originally designed as a tax haven from the then new 11% NPC corp tax now just feels like home. I know I'm playing the game wrong, but I've developed a play-style that suits my real life and KHU is a big part of it. So how did I do with the goals I set last August? Looking back at the KHU fleet one year ago is a real eye-opener. Last year, the pride of my fleet were two battlecruisers, a Cyclone and a Hurricane. I managed to lose the Hurricane on Christmas Eve and then its replacement about 3 weeks ago after a bout of drunken blogging. But the fleet is a lot more impressive than the one that boasted 4 tech 2 ships a year ago. Instead of 2 battlecruisers, the pride of the fleet is now a Maelstrom and an Orca and I have doubled the number of tech 2 ships from 4 to 8. Getting the Orca fulfilled my number one ship acquisition goal but I failed in my secondary goal of owning all Minmatar sub-capital ships. I was over optimistic in how fast I could learn how to fly all of the ships and how much isk I could earn in my playtime. Show me the money! Last year I came up with 4 ways to make money to finance my planned ship buying spree. So how did I do? Develop perfect refining. I managed to gain perfect refining skills in Core Complexion stations last August and went on to get them with Eifyr and Co., Six Kin Development and Nurtura. I never really used them as mining proved to not interest me that much. However, the skills come in handy when reprocessing low quality loot and drone minerals. And I don't sell the minerals on the market; I keep them for my own manufacturing purposes. Establish a datacore mining operation. I still haven't fully developed the operation, but I have expanded it from 1 agent to 6. And like my refining ability, I keep the datacores for my invention work. Doing courier contracts. Doing the courier contracts wasn't as much fun as I thought. Well, it was fun but really not profitable given my cash reserves at the time. In January I managed to make 30 million isk running contracts mostly within the Minmatar Republic. I decided to give up on that area until I had enough cash to make it worthwhile. I still haven't managed to amass the cash. Besides, running the distribution missions is easier and just allows me to relax (unless I'm running through low-sec). Planetary Interaction. The one thing that I didn't think I'd be able to do is my biggest source of reliable income. I was concerned about the time commitment but I'm able to do all my PI work in about 15-20 minutes. Then I'm usually going to sleep. But I estimate I'm making 200 - 250 million isk a month in high-sec. Perhaps I'm doing it wrong, but I don't think that is too bad given the effort I put into it. Wormhole operations. Epic fail! I never attempted to enter a wormhole over the last twelve months. Ramping up production. As usual, something at the bottom of my list winds up as something I really wound up doing. Of the eight tech 2 ships I own, I have manufactured five of them: Mastodon, Wolf, Hound, Stiletto and Rapier. And I have created a lot more tech 2 blueprint copies. Here is just the ships I can build. I've also spent some time doing material research on some of my tech 1 ship blueprints which reduces the production costs by requiring less minerals. So far I've only produced ships more my personal use, but I get a nice sense of satisfaction when the ships launch from the production facilities. So what do I want to accomplish in the year ahead? I've thought about it for a week or so and came up with this list. Cool Ships. I want to finish my goal from last year of owning every sub-capital Minmatar ship, but I can't see that happening. So I'll lower my goal and try to own every ship except the Panther, the Minmatar black ops ship, and the faction ships. Excluding the faction ships doesn't mean I won't try to own any. I just have a way I want to acquire them that I don't think I can get done by next August. I want to purchase the 2 run blueprint copies of the Republic Fleet Firetail, Stabber Fleet Issue and Tempest Fleet Issue from the Minmatar BPC agents. Why won't I succeed this year? Let's just say that I need an unmodified standing of 9.2 with the Republic Fleet to get the Stabber Fleet Issue bpc and my current standing is .07. So if I manage to get any faction ships this way I'll consider it bonus points. Oh, and this year I will finish up getting the skills to fly all of the sub-capital Minmatar ships. I've already created the skill queue in EVEMon to do it. Manufacturing. I want to build on the infrastructure I've created building ships for myself to start building items for sale on the market. In Everquest 2 I didn't really get into crafting for the market until year 3 and it looks like the pattern is going to hold for Eve Online as well. Before attempting to sell any tech 2 ships I think I want to sell tech 1 items first. I still need to do a lot of material research on blueprints but I have an idea of how I want to proceed. I do need to continue building my datacore farming network and perhaps try to find some sources closer to my home base. Wandering Rose. Although today is Rosewalker's birthday, I needed to decide what to do with Wandering Rose. I've read some authors who say that as they write that some characters just develop a personality of their own. The same is true for Wandering Rose. Originally created as an industrial alt, she has turned into the CEO of Khumaak Flying Circus and a pilot devoted to the cult of the autocannon. Where Rosewalker is more comfortable sniping at a distance, Wandering Rose prefers to get up close and personal with the enemy. Since Wandering Rose is the CEO, I've got three main goals for her. The first is to get the Elite Core Competency certificate. I just like having it because it means I shouldn't have any fitting problems. The second is to build leadership skills. Not just Corporate Management, but she needs to have the ability to use gang links as well. She flies a Hurricane in combat now and since I prefer shield tanking, the shield efficiency and shield harmonizing links would be perfect while running missions. And since a CEO should fly in style, I'd like to get her trained up to fly a Sleipner or a Claymore. The third goal is to continue improving her industrial skills. As part of that I'd like to finish up the starter profession certificates. And given my upcoming trip to Bulgaria, I might also put the Production Manager Elite certificate on my wish list. Can I accomplish all of that in 12 months? I doubt it, but that won't stop me from trying. Get out of my comfort zone. I've gotten really comfortable in Heimatar and Metropolis. I don't need to leave the Minmatar Republic, but I probably need to spend more time in low-sec. The way the game is developing high-sec is going to receive a series of nerfs over the next year and I need to get over my fear of space where people shoot at you. I need to get to the point where I take ships into those regions that don't stay cloaked throughout the entire trip. That's right, I need to shoot at things. I also need to go into some places where the NPCs are a bit more unfamiliar. That means doing exploration in high-sec as well as finally entering some C1 or C2 wormholes. What happened Christmas Eve shook me up and I've played it safe ever since. Now that the corp is a lot better off financially, I can take a few more risks. Role play. I would really like to get into role play. I even set up an account on the Backstage forums but didn't log in for months until last night. I wrote up background stories for both Rosewalker and Wandering Rose that I should update and post someday. I was actually disappointed when CCP decided to make it so others can see your standings with all the factions and NPC corporations. That was one less way to make the role play tie into the game. I'm not really sure how to get introduced into the role play community within Eve. I guess that's one thing I can try to learn. Too much? Am I trying to do too much? Probably. But if I try to do more than I possibly can, I can't claim I have nothing to do, right? I've wasted the last few weekends trying to catch up on sleep. I'm getting old and getting home from work at 2am and leaving the house at 7 or 7:30am is just not something I can effortlessly do anymore. But this weekend looks to be different and hopefully the little bit of time I could devote to Eve last night is a good sign. First, I was inventing Muninn blueprint copies and when I started the research I forgot to add a decryptor to 2 of the 5 blueprints in the batch. Oops. But when I took delivery, I had 2 2-run blueprint copies with a material efficiency of -2 and a 1-run blueprint copy with a material efficiency of -4. So now I can build my own armor HAC. Can you really be a veteran Eve player and not own one? Next was my skill queue. I booked the airline and hotel reservations for my trip to Bulgaria yesterday so I worked on setting up the skill queue to train a long skill during my three weeks in Sofia in September and October. And without too much trouble I managed to not only fit in training Battlecruisers V and the leadership skills required to fly command ships, but to start training Minmatar Battleship V the morning I leave. But the skill queue gave me some immediate gratification as well. Yesterday was the day I had scheduled to learn how to fly the Loki. So I went on the market (yes, I was already in a station that sold them) and spent almost 25 million isk on the skill books. Okay, so I can't afford to buy one yet. But when I can, I don't have to wait around training. Strategic cruisers should not sit around gathering dust just because you don't have skills. So things are looking up. Now if my workload will cooperate today, I'll have a weekend full of internet spaceships, learning Bulgarian and ... work. What, you didn't think I'd get to spend all weekend playing, did you? I've spent a good portion of my time figuring out how to fit my cargo-carrying ships and Nanofiber Internal Structure II modules always seem to wind up in my fits. I have a need for speed in wanting to get places fast. Maybe that's just natural for all Minmatar pilots. I don't know. But as I surf the internet, I'm discovering that nanofibers are not just some futuristic material that someone at CCP concocted. On Monday, Technology Review published an article on how nanofiber could help to repair tissue after a heart attack and aid transplants. "Regenerating blood vessels is important for combating the aftereffects of a heart attack or peripheral arterial disease, and for ensuring that transplanted organs receive a sufficient supply of blood. Now researchers at Northwestern University have created a nanomaterial that could help the body to grow new blood vessels. "Samuel Stupp and his colleagues developed a liquid that, when injected into patients, forms a matrix of loosely tangled nanofibers. Each of these fibers is covered in microscopic protuberances that mimic vascular endothelial growth factor, or VEGF—a protein that occurs naturally in the body and causes chemical reactions that result in the growth of new blood vessels. By mimicking VEGF, the nanofiber has the same biological effect." "This certificate represents an elite skillset in core skills. It certifies that the holder has an elite level of competence in core areas of fitting, capacitor, targeting, integrity and navigation. This forms an exceptionally strong core skillset which will benefit you in any profession you choose to pursue." I'm almost finished learning how to fly frigate and cruiser-class tech 2 ships and the skills learned obtaining the Elite Core Competency certificate will help when training up and flying the final three ship classes on my list: command ships, marauders and black ops. I still need to train up my missile, drone and electronic warfare skills to elite levels, but I'm feeling pretty good now about hopping into any Minmatar ship I've learned to fly. Eve's Peak Concurrent Users In July: Did Players Come Back? Now that CCP will no longer release the Quarterly Economic Report, attempting to get subscription numbers will be a challenge. Is the cancellation of the QEN a reaction to bad news caused by Monoclegate? And does that mean the subscription numbers are bad? I thought I'd take a look at July's peak concurrent user (PCU) numbers and try to determine the answer for myself. One thing that stuck me was that the numbers remained fairly flat all month. According to the numbers from the 30-day PCU chart on Eve-Offline, July started off with declining activity as the emergency CSM Summit in Iceland finished and a statement was published on 2 July. The numbers stabilized for a week, but in the middle of the month the numbers started declining again. The 7-day rolling average of PCU began to rise again on 20 July when CCP reinstated the PLEX for Buddies program that it suspended on 7 July. A look at Sundays, the busiest day on Tranquility, makes the case even clearer. In the 6 Sundays before Monoclegate, the PCU averaged 52,500, with PCU hitting over 53,500 as excitement grew over Incarna. But after the leak of the Fearless newsletter, the numbers plunged down to an average of 49,400 in the month of July, a drop of almost 6%. This is not a good sign for the game considering that Incarna was supposed to raise the retention rates of new players with not only avatars but an improved New Player Experience. Now, I am not the only one studying the CPU in Eve Online. Jester over at Jester's Trek also took a longer look at the CPU going back to the beginning of Eve and is also pointing out that the trend for Incarna is not good. But do the numbers indicate a declining player base? The numbers may just indicate players just don't play as long anymore. In the recent Aurum give-a-way, CCP stated that they were giving away 1,000 Aurum to each account, which is about 108,000 PLEXs. That comes out to somewhere in the neighborhood of 370,000 - 380,000 accounts, which is still higher than the 356,000 Eve accounts in existence at the beginning of the year. But if the number of accounts indeed has remained fairly stable, the lower activity numbers indicate a lower level of engagement by players. Is this the high water mark for Eve? I don't think so. CCP's recent partnership with Nexon will probably see a surge of new players as Eve is made more readily available to the Japanese market. But in the near term, CCP won't have the success they thought they were going to ahve because the players who left during Monoclegate don't appear to be coming back.